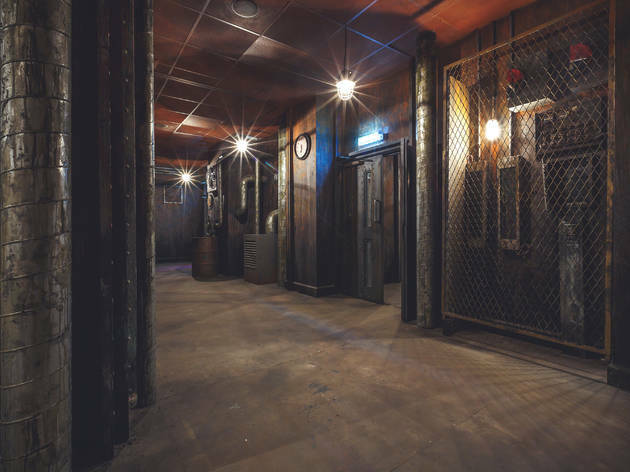 The Crystal Maze is currently closed and will be moving to the West End, opening spring 2019. It really seemed that cult '90s gameshow 'The Crystal Maze' had been relegated to the dusty VHS zone, to be rediscovered only by those who spend too much of their lives watching Challenge TV. Then a team of clever, ambitious and slightly mental people decided that, with the help of a Kickstarter, it wouldn't be impossible to rebuild the whole show, dome and all, in an old building in Zone One. Considering that said project would involve building dozens of game rooms in four different age-themed zones and a glass geodesic dome strong enough to handle eight adults flailing around in it, you'd think they'd mess up somewhere. The odd panel of wall left un-medieval, a cheap-looking bomber jacket, a distinctly un-Richard O'Brien-like gamesmaster. But it was perfect. 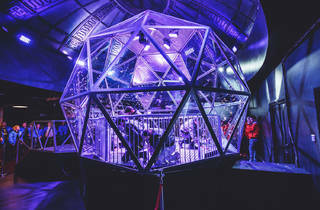 Our team of eight dashed through the zones, taking it in turns to play physical, mental, skill and mystery challenges in the hope of earning a crystal, and thus five extra seconds in the dome finale. We were rubbish, but it didn't matter. The joy of this experience is in the incredible sets, the brilliantly silly hosts, the games so faithful to the original show that you can nearly remember their secrets, and the opportunity to blast your team-mates with frustated yells and not have to deal with any hatred when their two minutes are up. This is ridiculously fun, both for the nostalgic value having grown up watching The Crystal Maze and of course for the puzzles themselves in each room. £50 felt like a lot at the time of booking, but it's totally worth it. It just goes too quickly, I could have been there for twice as long! A few bits of the set and games need a bit of loving and were showing wear and tear, but the budget value is embraced by the excellent and funny hosts. It was so hot in there we couldn't actually wear our Crystal Maze jackets, but that is forgotten in an instant when the games commence. Totally recommend it, if you can book it! I echo the sentiments of Milly: wear sensible clothing. It was definitely warmer than it was colder, the Aztec room had aircon so it was not too bad. I would not be wearing tight jeans or a dress- it would definitely hamper the fun! You could play about 3-4 games in each zone and yes the guide was amazingly great. It helps to just go along with it, get swept up in the hilarity of it all. There are different games: physical, mental, kill and mystery. All of them were well designed and it was quite stressful with the guide giving the time left. The end was pretty amazing, trying to grab tickets in your allotted time (based on crystals obtained). It took about 75 minutes all in, but wow it was such great fun! With Angel so close by, it's easy to continue your evening at other pubs, bars, and restaurants. I never watched the original myself (not being brought up in this country) but we all agreed it would be amazing to go again! It’s not every weekend that you get to live your childhood dreams. That’s right, you heard me. CHILDHOOD. DREAMS. This is not a drill. 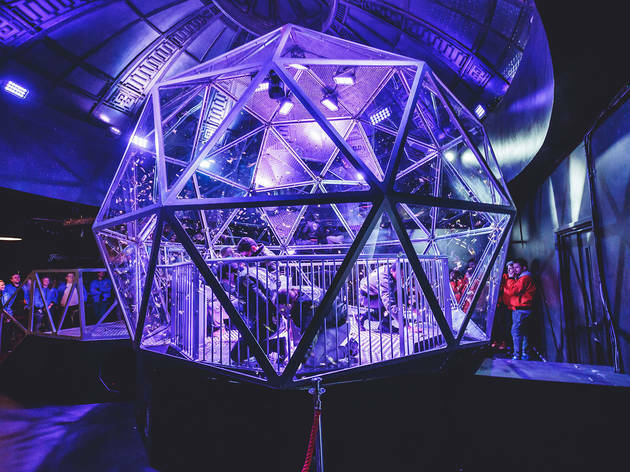 You can actually compete in the crystal maze and finally give your 6-year-old self everything they ever wanted. 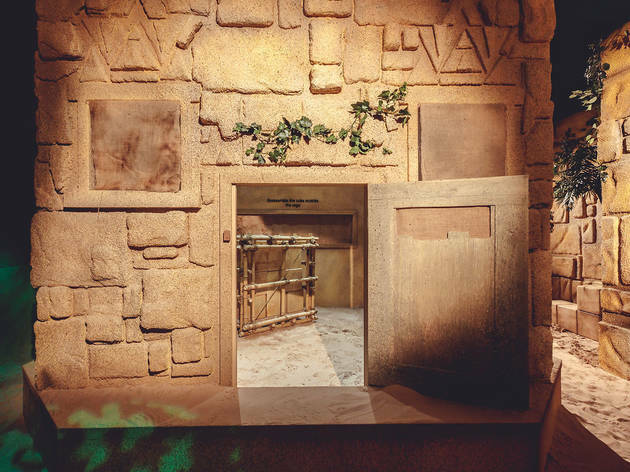 Without giving too much away here's your 'need to know' about the Crystal Maze. Guys when you inevitably book your tickets to this once in a lifetime incredible experience please remember to wear the lightest clothing available to you. It gets SO HOT in there. 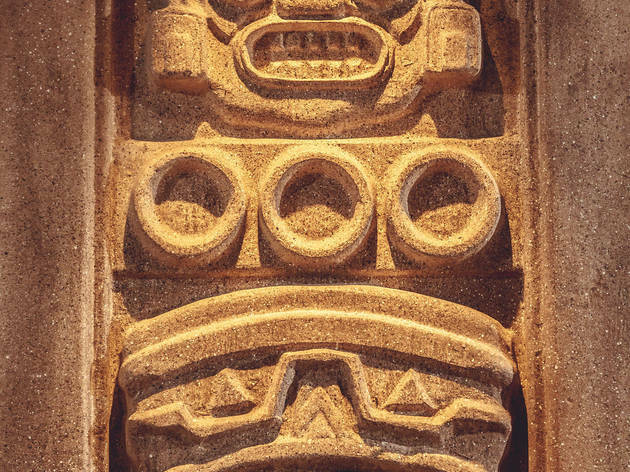 Plus the heat up the Aztec zone for a more authentic feel. I authentically sweated all over the place. This is no shoddy replication a la certain events in London where you pay ten hundred pounds to go into a warehouse and be greeted by some sort of rip-off pantomime. This feels like the real thing, each individual zone replicated so accurately I nearly wet myself with excitement. The challenges are equally ‘real’ and nothing is played down for ease. At one point I found myself scaling some metal poles, building myself a bridge as I went all in, in pursuit of the elusive crystal. This is no time to be cool. I mean, I’m assuming if you were willing to spend £63 quid on tickets to compete in the Crystal Maze being cool is not your top concern but I’ll say it anyway. Each team has a maze master who are amazingly enthusiastic and hilarious in the style of Richard O’Brien’s zany commentary. They give it 110% soget involved! Make their lives easy by enjoying yourselves. In the case of our team we very quickly lost all sense of social boundaries, shrieking and whooping, sweating profusely and screeching instructions at each other. Yes, it is £63 pounds to do this. Yes, that’s a lot of money. But let me ask you this? Can you really put a price on standing in the iconic crystal dome as golden tickets whoosh around your head? No you can't. You honestly can't. I'm not from the UK, so admittedly I had no idea what the crystal maze was prior to this year but no experience is required to enjoy this! 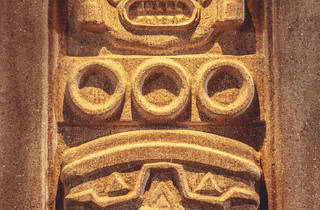 For those who aren't from the UK, think "Legends of the hidden temple" or similar. 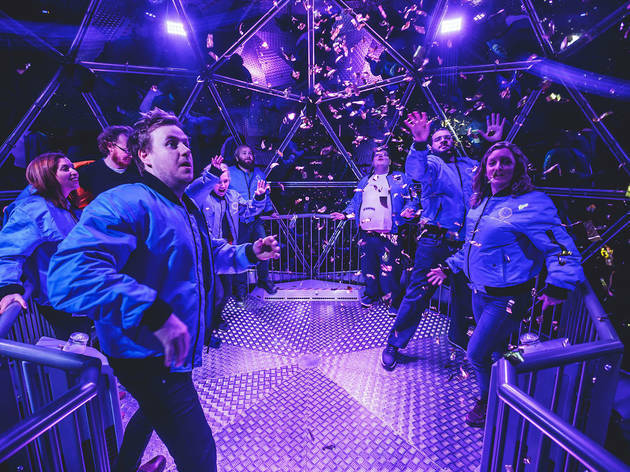 You have just over an hour to solve puzzles, twist through lazers and win crystals with your team before heading to the final crystal dome to play for the ultimate prize: the ego boost of beating everyone else. I managed to get 3 crystals for the team! You should go do it before the celebrities get a chance to, when it goes to air on telly soon. It was a real shame the English World Cup game happened the same night and out of 24 booked colleagues only me and two others decided to keep the honour and take up the challenge (the tickets were non-refundable). I didn’t grow up in UK, so it wasn’t until few years ago I was made familiar with Crystal Maze show and obviously I loved it and wanted to try it since (it all looked so easy!). As a captain of the team with two completely unknown colleagues who weren’t familiar with the game either, it was hard to nominate the right person for the right task. We epically failed at almost every task and finished the game with nor crystals whatsoever but it was so much fun! With such a small crew we had more chances to try ourselves in various tasked. I’m still counting bruises, but it was all worth it! If you’re a real fan, there’s a tacky souvenir shop with pens, mugs and limited edition of the famous bomber jackets. You can't take pictures and the ones they take cost £10-15 but from what I see they periodically post them on FB, so perhaps not worth paying? 'Team Splurge' was our adopted team name for a recent Birthday trip to the Crystal Maze experience in Islington. The whole trip was so much fun, from the anticipation in the waiting area, right through to counting the gold tickets at the end, and trying to better than the other teams. We got 2 teams together for my friend's birthday and boy it did not disappoint. 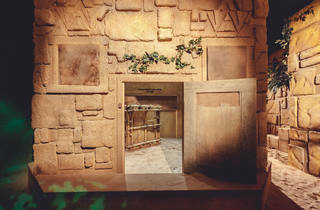 The set has been perfectly recreated and games were a good mixture of new and familiar rooms. There was a great team spirit in our team and everyone helped out on all the tasks leading to our ultimate VICTORY. However as many have said it is pretty darn expensive (£65 per person) and when you really get down to it, each person only gets to play 2 games each. There's no prizes for the winners when even the tiniest token would have been appreciated and everything is there to get you to spend even more - finishing drinks, shop were you can buy the crystal, photo, etc. To be honest it all just seems stingy when they're charging £520 per team with 4 teams playing at all times. That being said, everyone that went has been dying to go back and no-one regrets paying because at the end of the day it's one of those rare fun, bonding experiences. Start the fans please! This is something that I have been wanting to do since I first heard about it opening, I finally managed to get together two teams of 8 and it didn't disappoint! You go around as independent teams, which we knew but you do get to meet up at the end and watch each team enter the dome and you are in direct competition with them to see who can grab the most gold leaves which was a great touch! The sets and games were just like the show, it took me back to my childhood and it was brilliantly done! The games are quite hard, or at least they were for us and the time goes by crazy fast! Our Maze master Miss Chief was great throughout and really helped make our experience. It lasts about an hour and a half and so it is expensive and I do think the photo at the end by the crystal could be included in the price but was an additional £10 to buy. Overall, it was so much fun! I don't think you need to even have seen the tv programme to enjoy this, a great experience for all! Unlike most people who seem to do this, I am not really a fan of Crystal Maze. Obviously I had seen snippets of it growing and I was familiar with the concept but I think that your enjoyment is directly linked to how much of a fan of the show you are. That's not to say I didn't enjoy myself, I did. The tasks are varied and interesting, a lot of effort has gone into set design and our maze master was great. However, I do a lot of immersive experiences and on reflection I found this actually quite expensive. For an extra £5 you could have an immersive 4 course meal with alcohol pairings at the Gingerline which also lasts a similar amount of time. It was fun but expensive. Went for a team building event and it was great fun! I have never watched the show before but didn't feel confused or out of place. The inside of the building and was divided into 4 different zones. The game goes like this: Each team goes through the different zones to collect crystals, the more crystals you get the more time you have at the end to collect gold tickets. 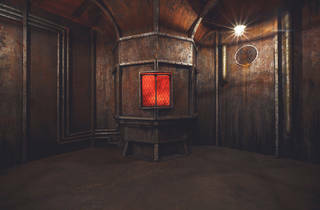 Every set was really well constructed, unlike many of the escape rooms where most of the props were flimsy. I think our host really made our experience go from good to outstanding. I would love to go again with friends if only it wasn't so expensive! Came from USA. Had a busy schedule and accidentally put down wrong time on our daily list. Thought I was 15 min early. But was 45 late. They couldn't do anything for us. Not even let us into the team we were supposed to have joined. No way to find out if there are cancellations. Told us to call about possible refund which seems really unlikely. Couldn't even view the maze rooms because they are supposedly constantly running. Only saw the crystal ball and the team grab money. Obviously our bad for missing the reservation but won't be able to come here again. Apparently you would do about two maze games per person. Which is like £25 per session (!!!!) plus dome. The more I think about it. What pathetic customer service. You'd think they could throw us a bone? Like allow us a photo op in the dome (no one was in it for a long time). Or pause the room for one minute for a photo op. I mean we are from overseas. Not like I can just redo next week. I had a brilliant time at The Crystal Maze! A massive fan of the show,I absolutely could not wait to go. With all of the original fixtures and fittings of the show,I was thrown down the rabbit hole into my youth of this quirky game show. I had the best Maze Master- The Baron! An energetic,deceivingly nimble,rotund fop of a man! Our companion throughout and kept us on our toes,whilst guiding us around the Maze. We finally got to the Crystal Dome and tried to grab as many gold tokens as we could.....we were all in such an excited frenzy,I don't think we did very well BUT IT WAS GREAT FUN!!! I want to go again NOW! I originally bought tickets for this back in December 2015, but only got the chance to enter the Crystal Maze in March 2017 due to plans changing - so I have waiting for this for a very long time! I was not disappointed and had a very enjoyable evening reliving my youth playing a variety of games, most of which seemed to be the same as in the original show. The hosts that lead you round are a bundle of energy, albeit very cheesy - The Professor was great and made the experience what it was. Being in the Dome was a childhood dream come true. I’m not sure I would do this again, especially as it is expensive, but I am glad I got to experience it at least once. This was my second time around playing the Crystal Maze. This time I went along with just my partner not with any friends this time so was put with strangers. This time round we played in the red team. I regret not playing with friends as was nowhere near as fun. 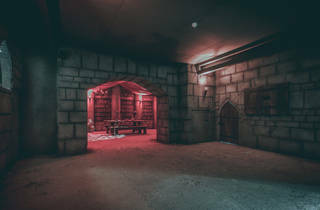 Also I wish I did not select being part of the red team as when we are led through the door to be taken to the waiting area to meet the host that will take us around the maze we walked past the dome. I have seen the dome before as I have played before but if you are new to the maze this would of spoilt the suspense of seeing the dome. Also the room we sat in and watched clips from Crystal Maze when Richard O’Brien presented it was quite boring with a few benches again nowhere near as good as last times holding area. The host also that we had on the night was not as entertaining and eccentric as the last host we had over a year back. The zones are all still all very well maintained and looked exactly like what you see on TV and the games are still very fun but because I had been before the games I saw was mostly all the same in what I had seen before and played so if you have been before then I would advise don’t go again until they have rebranded the maze with new games. However this time around when we played the maze we won the most gold out of all the other teams which was a result but alas still no prize for the winning overall team. It would be great if we got something even if it was a postcard saying you cracked the maze but nothing. 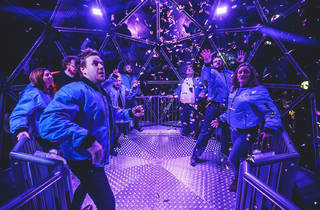 If you have not played the Crystal Maze I would though highly recommend for you to go along with friends as it is really fun and really does make you seem like you are taking part in the TV show. 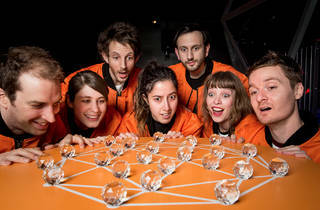 Fantastic team game for lovers of the original Crystal Maze programme! 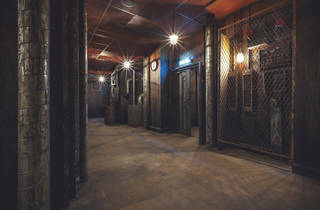 Your team are escorted with your games master (a very energetic, comedy fuelled individual) through four areas, Aztec, Futuristic, Medieval and Industrial. You have the choice of 4 different game styles, skill / mental / physical / mystery - your team captain must pick who is to perform each task before you see the room which adds a bit of fun to each game! Every one of us in our team of 8 got 2 games - just like on the tv, your friends / colleagues can cheer you in and offer advice from windows into the room. Some of the old classics straight from the tv show were in there and some failed games get you sent to prison where you must tackle a problem by yourself. The aim of the game is to collect a crystal in each games room, all of which give you 5 seconds in the Crystal Dome at the end. Collecting golden tickets in the dome is much harder than it looks! The game lasts around 75 minutes and is totally worth the £52 per person. We relived our childhood dreams in the maze and were running around like big kids! Highly recommend for groups of friends! I must disclose that I had never seen this show from beginning to end. However, despite my ignorance I ended up enjoying myself immensely. The grainy VHS tapes of hilarious footage from the 90s set the tone just before we entered the four playing zones. Although we didn't have Richard O'Brien, we had an equally flamboyant 'maze master' who would encourage and humorously denigrate our attempts in equal measure. The sets were well constructed. Our maze master kept our energy levels up and the rushing between the sets was faithfully reproduced. We all provided an unedifying spectacle whilst grabbing the golden tickets in the dome. However, friendships weren't lost and as a newcomer I would recommend this (quite expensive) experience to anyone else. Relived my childhood dreams, entering the maze! The tickets were bought almost a year ago and together myself and thousands of other purple crowd funded for this. In a secret location in kings cross, the set is unbelievable. They have recreated the four zones and also the dome! You have a games master taking you and leading you through the games. The games are bril and the whole set is very realistic. Unfortunately no phones or photos are allowed on set, but they allow you before and after shots with your bomber jackets on! Even in Aztec it was boiling hot, birds were chirping and there was sand everywhere. They also have the music theme tune pumping through, as you go to the different zones! It's a pricey thing to do at £60 for a weekend ticket, but it's worth every penny. I would actually do it again. Get your ticket now, but think it's already sold out for the rest of the year! An incredible experience! Lots of attention to detail... the nostalgia flows as you dash around the maze with the famous theme tune playing. My only regret is that the time passes so quickly! Sad to say I was pretty crap at the two tasks I took part in, though I did win ONE crystal which added a valuable 5 seconds to our final dome ticket-grabbing experience. Nostalgia is big in 2016, and if like me you are a late 80's/early 90's baby you're probably beginning to realise that our days in our 20's are numbered, so anything we can grab onto to make us feel young again and transport us back to a simpler time is going to be welcomed with open arms. 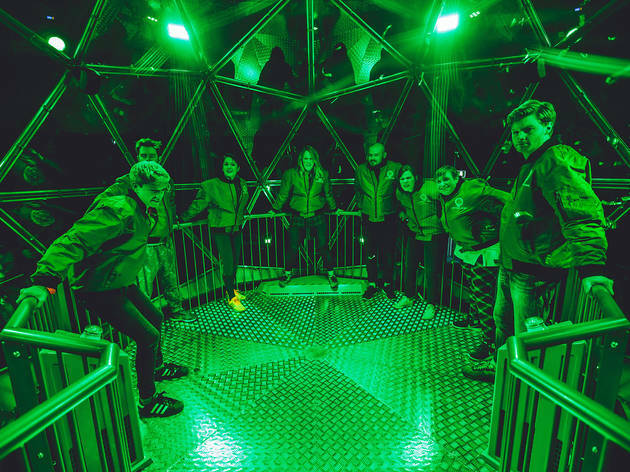 But it isn't the transportation back to our youths that makes The Crystal Maze so amazing (though the use of old TV monitors and polyester bomber jackets does help) but rather the superb attention to detail throughout the entire experience! From the design of each section to the energy from the "presenter" that takes you around the challenges. It is honestly like stepping inside the show, exactly as I remember it being. Even some of the games are exactly the same as what I remember on TV - EXACTLY THE SAME. You really can see where all of that crowd funding money went, it's an absolute testament to kick starters. In teams of 8 (in our case, us plus 6 strangers) you enter the maze after appointing a team captain and a deputy and the challenges are appointed. 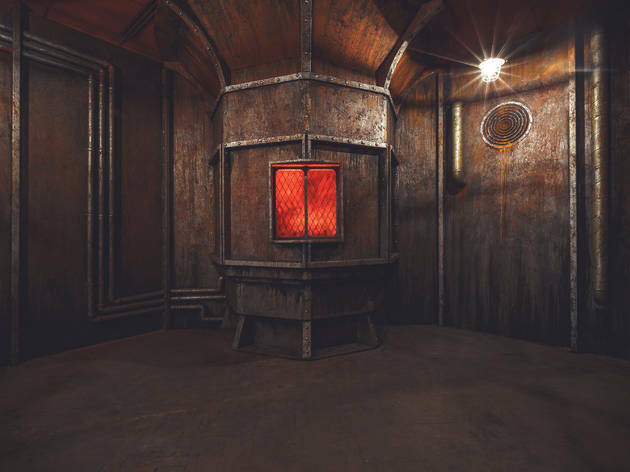 Within your hour and a bit in the maze, each person is given the chance to complete 2 games each - I had a mystery in the industrial zone and a skill in the medieval zone. I'm almost embarrassed to admit I only returned one crystal but proud to announce I didn't get locked in. In fact, none of our team did - together we collected 14 crystals before it was our chance to enter the crystal dome at the end where we scrabbled around for 70 seconds collecting golden tickets. What a rush, what a thrill! You win absolutely nothing other than pride and possibly your team name on the leader board (which is 193 tickets we did!) I absolutely adored the entire afternoon and would happily shell out the £60 or so to do the experience again. I've convinced my brother to get himself a ticket... For 9 months time because yes, that's how sold out it is!! But believe me, it's worth the wait! Derr-de-de-de-derr, de-de.... Cast your mind back to the mid 90s, Brit-Pop is in full swing, Eric Cantona is busy performing King-fu kicks and the Spice Girls are helping two become one. 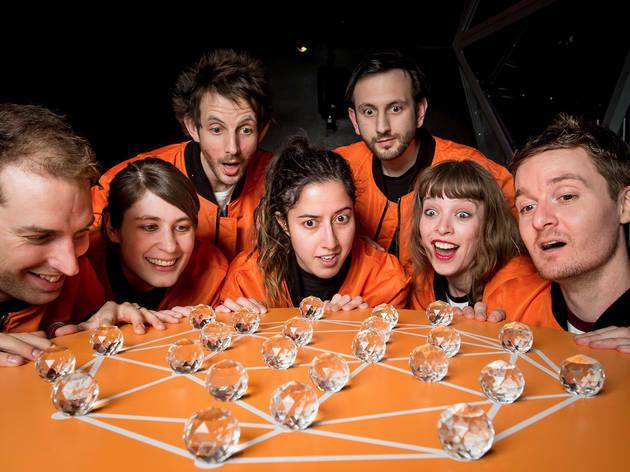 After re-arranging your Polly Pockets/Micro-Machines you nestle into the sofa to catch the TV highlight of the week, a bunch of shellsuit-clad eager beavers testing their mettle in THE CRYSTAL MAZE! Back then we could only dream to join our hero Richard O-Brian and show those numpties how it's done. Well I've got news for you, now you can (albeit minus O'Brian)... Thanks to a bunch of geniuses, the maze has been resurrected in an unassuming office block just round the corner from Angel station. 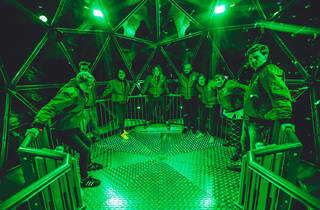 Pull together a team of eight, don a very tasteful bomber jacket and enter the maze. After a briefing from your allocated O'Brian replacement (in our case diamanté cod-piece wearing Chris Towel) pick your team leader and step into 75 minutes of unadulterated joy. 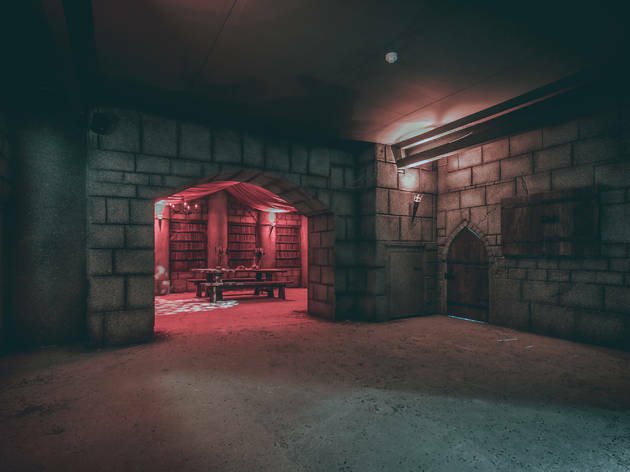 Choose between physical, skill, mental and mystery rooms and select the appropriate teammate to take on the challenge, look through the windows and yell inevitably unhelpful comments to guide them through the task. Each room perfectly recreates the nostalgia of the 90s show, there's no fancy fan-dangled gadgetry, just some good old fashioned manually operated games. God forbid you get 'locked in', don't worry, they'll just set you a challenge to rejoin your team and if you fail, sacrifice a crystal to get them back. You have 15 minutes in each area, Aztec, Futuristic, industrial and Medieval. Each zone is pretty authentic, there's the odd weird 'extra' (actor), I'd like to have seen a few more of these, particularly the living plants, but perhaps the crowdfunding budget didn't quite stretch that far. Once you've mastered the maze, on you trot to the pinnacle, the dome! All four teams come together to present their booty before battling it out a team at a time to look like fools trying to catch flies (i.e. tokens). What's more there are only gold tokens in this dome, so we're all winners. As you've probably gathered by now from my rave review, I bloody loved this place. I would happily spend every Sunday there....perhaps I could fill the gap of an extra?! The Crystal Maze is my first, my last, my everything. If it were permitted I would make the Maze my wife, and we would raise our tiny Crystal children together in the safety of the Dome, golden tickets fluttering around us from now into eternity. In short, it is very good, and you will laugh the laugh of the ages inside the many Zones. Money well spent, although, disclaimer, I did in fact go for free.